FoodCheck, revolutionary application developed specifically for Android tablet devices, can minimise dangerous and costly errors in food preparation according to developers at Origin Partners and Kelsius. FoodCheck is a clever innovation that solves a clear industrial need and it also underlines just how far mobile is reaching into all aspects of modern living. Digital agency Origin Partners has revealed details of a revolutionary application developed specifically for Android tablet devices that can minimise dangerous and costly errors in food preparation. 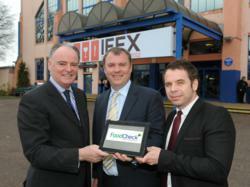 Developed for Donegal firm Kelsius - which designs, manufactures and delivers temperature and task management systems for the food and healthcare sectors - FoodCheck is a pioneering HACCP (Hazard Analysis & Critical Control Point) tablet application that automates the process of controlling and monitoring food using wireless temperature monitoring. Designed to align with strict Food Standards Agency (FSA) processes, FoodCheck offers managers real-time visibility of compliance and immediate non-conformance alerts. The easy-to-use system is suitable for a broad range of businesses including convenience stores, restaurants, hotels, fast-food outlets or catering supply companies. “FoodCheck is positive news for everyone and gives new confidence to anyone working in the food production and preparation business. It enables business owners to carry out the once laborious checks and balances in a more efficient, consistent and traceable way. For more information on FoodCheck or other Kelsius products visit http://www.kelsius.com. Founded in 2006, Origin Partners Ltd has established itself as a technology market leader for mobile and interactive applications having designed and installed cutting-edge solutions for clients such as Alfa Romeo, Ulster Orchestra, Plimsoll Publishing, Elevate Sports, Olly the Little White Van and Carphone Warehouse.